Move over disco ball, there’s a new shiny party object in town and it’s a lot cooler and more captivating. 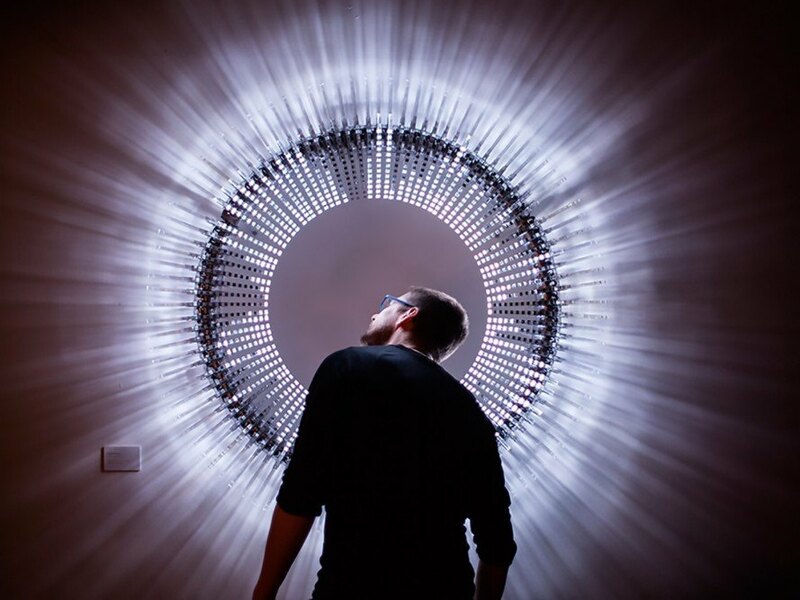 Meet DiscoDisco, a sound-reactive LED installation that glows like the sun and can respond to any noise, from the snap of your fingers to the beat of your favorite song. The modular music visualizer was initiated by creative entrepreneur Alex Asseily and design company Goodwin Hartshorn, and then developed into a fully functioning product by creative studio Haberdashery. We recently spotted DiscoDisco at Designjunction, a trade show for cutting-edge contemporary design held every year at London Design Festival. Described as a “21st century disco ball,” the sound-reactive sculpture is constructed from a modular system of acrylic fins that direct light into long sunray-like beams. The LEDs are arranged on a mountable circular ring and can be programmed to light up with different patterns in response to a variety of outside triggers. Though DiscoDisco’s current model is arranged as a circle, the lighting installation can easily take other shapes. Custom-built PCBs control and interpret video footage and turn it into abstracted pixelated images that appear on the sculpture. “This installation questions the relationship between the viewers and the artwork,” says Haberdashery. “Do they adapt to the rhythm of the sculpture in front of them, or does the sculpture adapt to them? Who is in control? Does it actually matter?” The DiscoDisco recently placed third in the darc awards. We recently spotted DiscoDisco at Designjunction, a trade show for cutting-edge contemporary design held every year at London Design Festival. Described as a “21st century disco ball,” the sound-reactive sculpture is constructed from a modular system of acrylic fins that direct light into long sunray-like beams. The LEDs are arranged on a mountable circular ring and can be programmed to light up with different patterns in response to a variety of outside triggers. Though DiscoDisco’s current model is arranged as a circle, the lighting installation can easily take other shapes. Custom-built PCBs control and interpret video footage and turn it into abstracted pixelated images that appear on the sculpture. The DiscoDisco recently placed third in the darc awards.